What is a wolf-dog hybrid? A wolf-dog is a cross between a pure wolf and a dog or another wolf dog hybrid, usually Malamutes, Huskies and German Shepherds. Hybrids tend to be heavier and taller that wolves. There are many myths about wolf-dog hybrids, some are about them being viscous and untrainable, others say they are as docile as the family golden retriever, as with dogs each animal is different, some are good and some are not. That said, the wolf-dog being a cross between a wolf and dog needs special training and a person with dedication. Another aspect of wolf-dog ownership is the position of alpha, A dog, even a stubborn one can be mastered, a wolf-dog will always try to test the owner for dominance, like in a wolf pack, the owner must be the alpha and will have to dominate, if not you will have a constant battle. I am not against wolf-dog ownership per say, I just believe that one has to make an informed decision; do you have the space?, dedication?, know the rules and laws of your state or province?, Know the diet you need for the animal?, can you provide the medical care? People have to understand that a wolf-dog is still part wild, it will never be the docile family pet, these animals have special needs, both physical and mental. The Tragic truth is that many wolf-dog hybrids end up at the Humane Society, and once there they are put down, because it is almost impossible to place a hybrid with a new owner, due to the fact that they develop a strong bond, Some Veterinarians will not treat wolf-dogs, in some jurisdictions it is illegal for them to treat wild animals such as wolves and hybrids. If you are looking for a pet, I would recommend a malamute or husky if you want a animal that resembles a wolf, if you understand all this and still are interested in owning a wolf-dog hybrid get all the information you can get, have all the facts, talk to other wolf-dog owners, Breeders, etc. The Pure Wolf as pet? Most People, once they learn the truth about wolves and thier true nature- will sometimes want to go and purchase a wolf pup. They see the wolf as a tangible symbol of the wilderness, they envision movies like white fang, and have misplaced ideas about helping an endangered species by keeping one as a pet. Exotic pets have special nutritional needs that cannot be met by the average homeowner. Some animals such as the wolf, have territorial needs that cannot be duplicated at home. The inherent wild nature of the wolf cannot be removed. wolves also need special exercise needs that far surpass that of the domestic dog. Wolves are pack animals they need the support of the pack, a lone wolf may become stressed and neurotic. 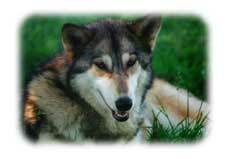 A pure wolf should never be a pet!, there are a few rare exception of wolves in captivity, wolf organization, such as wolf haven and wolf park, who have dedicated biologists and staff, they are rescuing animals that would otherwise have no where to go.